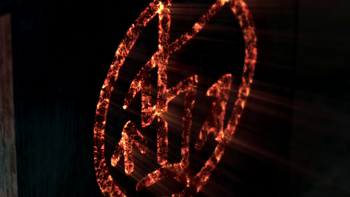 Dean activates the ignition sigil. When the angels kill each other off, the humans are taking it in the teeth. So what if I wanted to clue the human in so that he, or she, could spit the angel out? Angel suppressing sigils are used as way of giving control of a vessel to the human the angel is inhabiting. Unlike angel banishing sigils, they do not have to be drawn in blood, though blood needs to touch the ignition sigil for the spell to kick in. Though not shown, Kevin indicates that there are multiple sigils used, that once activated, it will briefly hobble the possessing angel, giving control to host. However if one sigil is altered, even the slightest, it will hinder the spell. When Castiel tells Dean that the angel Ezekiel died during the fall, Dean tasks Kevin with finding a spell that would "power down" the angel so it would not be in control. Kevin gets as much information as he can from the angel tablet, but is forced to use an old Men of Letters book for the rest of the necessary info. He and Dean go about painting a storeroom in the Bunker with the sigils, that according to Kevin will "briefly hobble the possessing angel." However, Gadreel overheard Dean asking Kevin about it and was able to alter a sigil which altered the spell, rendering it useless. Sam and Dean prepare the suppressing sigils for their summoning of Lucifer. 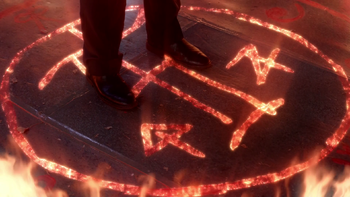 After Dean summons Lucifer, Sam ignites a ring of holy oil around Lucifer. When Lucifer sees the Horn of Joshua, he assumes the Winchester will give it to him. 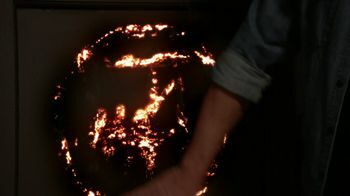 However, Dean cuts his hand and ignites the sigil, allowing Castiel to briefly gain control. It doesn't last long though, and Lucifer is able wrestle control back as the sigil begins to fail. This page was last edited on 27 March 2019, at 07:53.